This wonderfully easy side dish tastes as good as it looks! Everyone loves potatoes and this side dish will become a favorite in your house too. 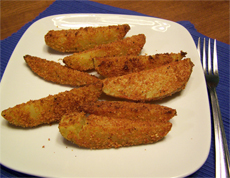 Seasoned with Parmesan cheese and spices gives these wedges such a wonderful flavor. Crisp outside and tender inside. Serve them along with your favorite dipping sauce but they are fabulous just as they are. Preheat oven to 400 degrees F. Place the first five ingredients in a zip top bag and shake to combine. Set aside. Scrub potatoes and cut into wedges. Place wedges in a shallow dish and drizzle with olive oil. Toss with hands to be sure they are coated in olive oil. Add a few wedges at a time to your zip top bag and shake until coated. Place potatoes on an ungreased sheet pan. Repeat process until all potatoes have been battered. Bake for 25 minutes or until potatoes are fork tender.